Thailand is a wonderful country with some very good diving. Phuket and Krabi lie in the west next to the Andaman Sea, where the best diving in Thailand is to be found. October to April is the best time to visit this part of Thailand. Heavy rainfall hits the Andaman coast in May and continues until September. During this time, therefore, the Gulf of Thailand to the east might be a better dive destination. But still, even then the Andaman Sea often has the better visibility and coral. With an average sea temperature of 26 degrees, the water is nice as well. Phuket is a large island connected with the mainland by a bridge in the north. It is tourist destination number one and therefore has it all. Accommodation in Phuket are great for backpackers as well as more luxury tourists. Phuket and Krabi have the nightlife, the good restaurants, the beaches and of course the scuba diving. Dive sites near Phuket as well as the offshore reefs are excellent, but the latter have in general a slightly higher visibility. Scuba dive in Ao Nang, Krabi Thailand with the most highly rated and friendly diving center in Krabi. Whale shark diving to Hin Daeng & Hin Muang from Aonang beach, PADI dive courses, Nitrox Diving, Phi Phi diving trips & Similan liveaboard trips. If you're diving in Krabi - Dive Aqua Vision! Looking for the best value deals to dive in Phuket, the Similans or Thailand? Palm Beach Divers is a 5 star PADI instructor development course (dive) center on Koh Lanta, Thailand. Breath diving , dream diving , get a diving life ! Learn how to dive ! Become an advanced diver ! Visit our beautiful dive sites! Top diving with the best service available. Excellent diving guides , diving courses , instructor courses , dive sites and diving instructors ! Book diving or contact us now ! Ko Lanta is excellent for diving ! Special equipment packages to buy / order your equipment before you get here ! Padi courses, Padi discover scuba diving , Padi open water diver course , Padi advanced diver course , Padi rescue diver course , Padi speciality diver courses , Padi go pro courses , Padi divemaster course and Padi instructor (IDC) courses. Palm Beach Divers offers daily diving and guided snorkeling trips, leaving directly from the beach on a spectacular new boat. Special this year: Padi shark awareness diver and snorkeling distinct speciality courses ! Scuba Cat Diving, Phuket, Thailand, a British owned Dive Center, is a 5 Star PADI CDC Center and has been a 5 Star PADI IDC center for more than a decade. We teach all levels of PADI Scuba Diving Courses, have a dedicated boat for Scuba Diving Day Trips to the best Scuba dive sites around Phuket and Koh Phi Phi Island, Thailand. 2 liveaboards year round in the Similans, Koh Bon, Koh Tachai and Richelieu Rock and all the best Scuba Diving sites in the Andaman Sea, Phi Phi, Koh Ha and Hin Daeng. Scuba Cat Diving, Phuket, is known worldwide for training quality and customer services having an excellent reputation within the diving industry for producing first class and highly employable PADI Instructors from their PADI IDC's. Scuba Cat Diving, Phuket, Thailand is the only PADI 5 Star CDC Center based on Patong Beach, this is the highest PADI Dive Center achievement possible. PADI CDC distinguishes us from the rest. Scuba Cat Diving, Phuket, Thailand teaches tec diving including Gas Blender, DSAT Tec Rec, Trimix, and rebreather courses up to Instructor level. Many of these courses are onboard our own liveaboard MV Scuba Cat in the Similan Islands at no extra cost. Scuba Cat has Nitrox and Trimix diving capabilities and is the only dive center in Phuket to offer the full range of IAHD Diving courses up to Instructor level. Additionally, Scuba Cat Diving has Scuba Tank filling stations to be confident of both land based and aboard our daytrip and liveaboard boats. Scuba Cat Diving, Phuket, Thailand are proud to have comprehensive diver training facilities at their 5 star PADI CDC Center and a well located Scuba diving shop on Patong Beach including 5 fully equipped classrooms catering for students of all levels and a dedicated scuba dive training swimming pool. Scuba Cat conducts all levels of PADI Courses aboard our liveaboard MV Scuba Cat during the Summer Season at no extra cost including PADI MSDT Instructor training. We pride ourselves on catering for the individual beginner Scuba Diver to the most technical diving addict with many tec dives conducted from our liveaboard boat MV Scuba Cat. We teach all the PADI Courses, Instructor Development Courses (IDC) and other instructor courses. PADI is the largest scuba diving organization in the world. As a PADI Professional Scuba Diver you will find work in more than 180 countries in the world. Scuba Cat Diving, PADI 5 Star CDC Center, Phuket, Thailand offers the most complete Scuba Diving all inclusive Career Internships in Thailand. We give the opportunity to our PADI IDC candidates to have a wide view of the dive industry. Scuba Diving is everywhere. Our candidates get liveaboard experience in the Similan Islands or the Andaman Sea. Scuba Cat Diving was the first National Geographic Center in Phuket - another high dive center status offered through PADI. Scuba Cat also is an active Green Fins Member and has an active Reef Check team. Scuba Cat owns and operates a fleet of dive boats to provide the most enjoyable of day trip Scuba diving, liveaboards, and snorkeling. We are innovators of a variety of diving products in the area; "often imitated - never copied" for liveaboard diving in the Similan Islands and during the Summer Season. Visa Diving Center is a 5 Star IDC Centre located on Ton Si Bay, Koh Phi Phi. Established in 1998 we have been teaching people how to dive from Discover Scuba Diving all the way to Instructor for many years! Our staff are experienced, multi lingual and we keep our group sizes small so that you get the most out of your dive experience with Visa Diving. For us diving isn't just a business it's a way of life!!.. Looking for the best thing to do on your holiday in Thailand? 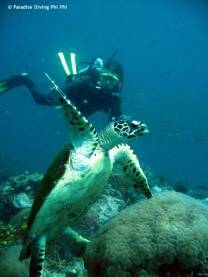 Scuba diving and snorkeling tours from Phuket, Khao Lak, Krabi and Koh Lanta? With more than 30 years of experience and four dive centers around Southern Thailand, Kon-Tiki Thailand Diving and Snorkeling Center, can offer you the full range of daily scuba dive trips, PADI scuba diving courses from beginner to Pro, liveaboards to Similan Islands, snorkeling tours and technical diving courses. The choice is yours for unforgettable memories in the "Land of smiles" Thailand! To all those who dive Thailand, individual Shipwreck accounts concerning Thai wreck diving with detailed up-to-date dive site reviews from experienced local Thai and Western divers, technical dive planning software, Important dive site safety information and Historical research data concerning the events that caused the vessel's loss, will open up a wealth of information plus identify how to dive dozens of Thailand's more obscure and interesting wreck diving sites. Complete travel and activities guide to Phuket and Thailand, where to stay and party, sightseeing, transportation and diving information. Asia Marine is the largest and most experienced yacht charter agency in Phuket, and also Thailand's leading boat broker. Phuket sailing is our special expertise. Sailing Phuket is our forte. We operate from the resort island of Phuket on Thailand's west coast, Asia's center for yacht charters, sailing and a wide range of marine activities, including fishing boat trips, scuba diving, Phuket sailing, pleasure boating, and snorkeling. Dive Center Phuket Nai Yang Beach. Paradise-Divers lead you to the best dive sites around Phuket. We do Liveaboard to other Islands as Similan or Koh Phi Phi as well as PADI-Courses at the Hotelpool and near beach. We would be pleased to hear from you!